SKU: Chip 7 Pack-BBQ Categories: Protein Food, Chips Tags: Best Sellers, Ready to Enjoy! Bari Life Barbecue Protein Chips are sold in increments of 7 bags. It’s been a long time since I’ve had chips. I was sceptical at first, but gave them a try since the other products taste so good. These are no exception. Taste better than regular chips without all of the calories, carbs, fat and grease. Portion control is a plus and a bag is very satisfying. Love them! These are very tasty and crunchy. Definitely worth it. 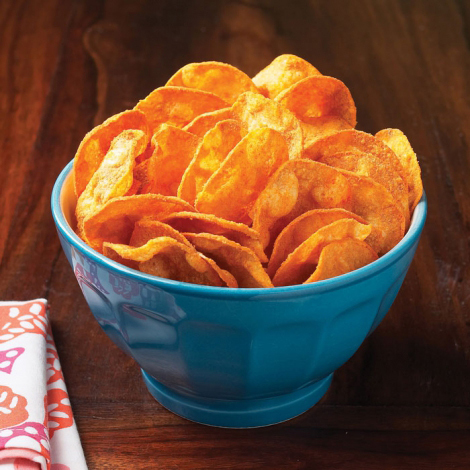 If you are craving chips, this one is a winner! I have tried the Ranch and Dill, which I also like but this one is my favorite. I wanted some chips for snacks because I was craving carbs with crunch. These chips deliver on carbs and crunch with the bonus of protein. I felt full and satisfied after eating a bag as a snack and didn’t feel like I had blown my carb & fat count all to heck with regular chips. So, it’s a good healthy “cheat”. However, I wish the bbq flavor had tasted like bbq. It didn’t. There is a sweet flavor to the chips, but it doesn’t taste like bbq. At least to me anyway. I will eat them and they do taste good, just don’t expect the bbq flavor you get from other store brand chips. Otherwise, they are good. great crunch and flavor! A go to snack when a little something is needed………….. I loved these chips! I wanted to eat them every time and the pasta. They have a very good taste! The only problem is I wanted more! I love these chips. They have a wonderful taste, and like the other reviews state, they are great with a mug of hot soup or a sandwich to help feel you up and let you “chew” something. If you are looking for an option to replace your chip habit, you should definitely give these a try. They are more crunchy than your typical chip which I had to get used to but I love the BBQ flavor. It’s a little sweet and savory. These are a delicious snack alternative. Yes, you should try these. I loved these “chips”! It’s so nice to have just a sandwich and chips for lunch sometimes without feeling bad about eating “bad food”. these are good for you with great flavor! Very Good flavor…love the crunch. It’s so nice to have “chips” with a sandwich. I would highly recommend this! Ok, so it’s not a regular bag of chips. But that’s why you’re here; Searching for a substitute. These are very crunchy and surprisingly tasty. I would definitely recommend.